I’m hoping you can offer some advice as we enter the Holiday Season. We have four kids ranging in ages from 5 to 11 years old. We have never done Santa in our house. I don’t have anything against it, it just didn’t make sense for us. We take a family trip every Christmas instead of gifts. Ever since our kids were little we explained that most kids do believe in Santa and not to ruin it for them. They have been great about this, and enjoy being in on the secret. I don’t want my kids to spoil the fun for other kids, but I also don’t want them to lie. We do have an Elf on the Shelf, but my kids just rotate hiding it each night. They have a lot of fun with this and that means no stress for me. We live in a great neighborhood and kids are constantly in and out of our house. Last year one of my daughter’s friends was over and my kids were playing with the Elf. The little girl was upset because I guess most people don’t play with the Elves. Her mom texted me later and asked if we go along with the Elf and not tell their daughter that it can be played with. I am HAPPY to not spoil Santa, but I do not want my kids to lie. These are also 9 to 12-year-old kids that I’m talking about. Do you have any suggestions for how to handle this appropriately? I have a feeling the same issue may happen again this year. Tell your kids to leave the Elf on the Shelf when other kids are over. That’s…probably all you need to do! Much like Santa, this can fall squarely into the “don’t spoil the fun for other kids” category. We also have an Elf in our house, and I’ve seen first-hand the confusion/upset it can cause a small child when someone “breaks the rules” and touches/moves him. (My father-in-law Does Not Get It, despite our many attempts to explain.) In the Elf on the Shelf story, this causes him to lose his magic and he won’t move around at night or go back to the North Pole or whatever. So it’s definitely a big part of the tradition for many families that Elf is not touched or played with. I get that we’re talking about older kids here, but I had a child who REALLY REALLY believed (or wanted to believe) in Santa until he was 11 years old, so…I also get that. He now moves the Elf for his little brothers and, like your kids, loves being in on “the secret.” (Although I am 99% sure my younger kids have also figured out the truth, but still enjoy playing along. So we all still play along.) But he will never let them see him touching the Elf. Think of Elf as a game, rather than a lie. 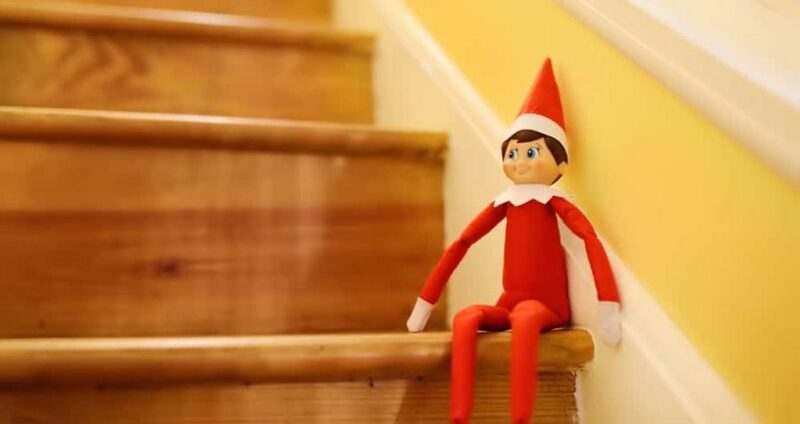 Ask your kids to please follow the “rules” of the game when their friends are over and leave Elf alone — he’s such a fixture in so many homes these days that I doubt the topic will ever come up again as long as nothing out of the ordinary is happening. Though if the girl from last year visits again this December, I’d just hide Elf completely out of sight ahead of time so it doesn’t spark a memory or any questions that require further explanation or invention. I love that last bit about the elf not being worth it. We don’t intend to do the elf at all. I think it’s creepy. I didn’t even know there was a part to it where you can’t touch it. This may be an unpopular opinion. No one is obligated to help another parent maintain their child’s beliefs about the Elf, Santa, or anything else. It’s surprising to me that a mother would text another parent to request that they essentially change habits in their own household. Other families are into Elf on a Shelf, and that’s cool, but there is no way I’m going to tell my kids they have to go along with it.